Pella Security builds custom gun safes for Iowa and the Midwest area. Our high quality safes are perfect for in the office or at home! There is a burglary in America every 10 seconds. FBI data informs us that we have a one in four chance of being burglarized in the next 10 years. Millions of dollars are lost each year to intruders who have little to lose. We also know of the possible dangers of firearms falling into young inexperienced or even criminal hands. The best solution to this problem is to protect our firearms and valuables from such dangers. 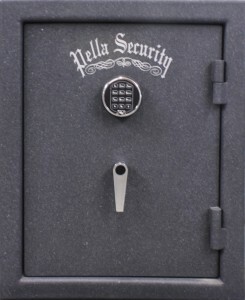 Pella Security Products offers a wide variety of heavy duty safes with bank like security features incorporated into each and every one. According to the National Fire Protection Association, fire strikes every 51 seconds. Six percent of us will experience a serious fire in the next 10 years. Billions of dollars are lost each year, leaving only charred remains of your valuables. For complete peace of mind – Pella Security Products offers two fire protection packages to choose from. Tested and proven by an independent laboratory committed to fire research. The Quadra Wall Insulation has been tested and proven to protect important heat sensitive items, such as papers and documents, from external temperatures in excess of 1500 degrees F, while keeping the inside temperature from rising more than 275 degrees F in 50 minutes. This is accomplished by laminating two layers of 5/8 inch thick type C fireboard inside the steel walls of the safe. An effective heat release system allows the hot gases to vent to the outside of the safe to maintain low inside temperatures. The door is also protected by a 1 1/4 inch layer of type C fireboard, which is enhanced with a 2 1/2 inch dead air space. A Palusol seal is then applied to our trifold frame. This heat activated seal swells to 15 times its original size to seal out heat and smoke and water. The Quadra Wall Insulation is standard on all models.